With record snowfalls and bitter cold winds, this winter is one for the record books. If you've had enough of snow shovels and road salt, it's time to think about a family-friendly getaway to a place where spring flowers are blooming, the mountains are blanketed in vibrant green, and the air is filled with birdsong. It's springtime in the Great Smoky Mountains, and with Springfest just weeks away, now is the time to start planning your trip. As winter loosens her grip on the mountains and tender spring shoots begin to appear, Smoky Mountain Springfest kicks off with a variety of activities to celebrate the season. Not only will you love watching the mountains come alive, but you'll enjoy the best musical entertainment the area has to offer as well. And food? You won't find any better. The three-month festival begins in March, as the first flowers come into bloom. 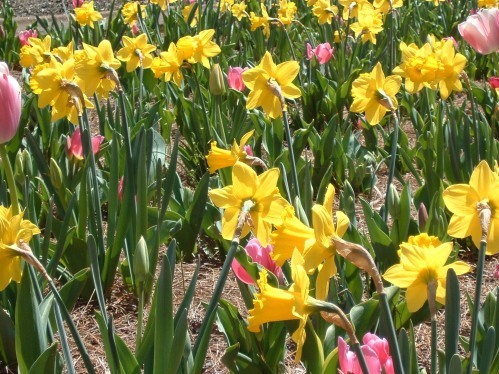 You'll find daffodils, tulips, pansies, petunias and more lining the streets of downtown Gatlinburg, Tennessee. A stroll in the warm afternoon sun is a delight for the senses as you soak up the lovely scent of the mountain air and the glorious colors of the plants and flowers that decorate the area. Live entertainment is found on every corner, too, turning your afternoon walk into a musical event for the whole family. Easter Sunday begins with a special sunrise service at Ober Gatlinburg. You'll be treated to a spectacular view of the valley as the sun appears over the mountains, bathing everything in golden hues that have to be seen to be appreciated. Even better, you can start your day with a breathtaking trip up the mountain in Gatlinburg's aerial tramway, a ride that is an event all by itself. Nowhere else will you enjoy such stunning views as the landscape spreads out below and Mount Harrison looms above. As April unfolds, the mountains come alive with wildlife. Nature lovers will want to hit the trails for a look at some of the nation's most amazing scenery. The annual wildflower pilgrimage, hosted by the University of Tennessee Botany Department and the Gatlinburg Garden Club, offers more than 150 different hiking tours, allowing visitors to see a world they might not otherwise ever encounter. Hikes range from beginner to advanced, so no matter your skill level, you'll be able to enjoy the event. Foodies in your family? Don't miss Gatlinburg's Ribfest & Wings. This much-anticipated street party features more than 30 vendors, each offering up their best barbecue to tempt your taste buds. And of course it wouldn't be a party without live music and plenty of fun. Springfest continues throughout April, May and into June, so no matter when you plan your getaway, you're sure to find something to delight the family. From the glorious blooms of early spring and street musicians to tasty barbecue, there's no end to the ways to celebrate the warmer weather and the arrival of spring.